1. Department of Pathology and Laboratory Medicine, Kaohsiung Veterans General Hospital, Kaohsiung, Taiwan, ROC. 2. Division of Nephrology, Department of Internal Medicine, Tri-Service General Hospital, Taipei, Taiwan, ROC. 4. Department of Orthopedics, Taipei Medical University Hospital, Taipei, Taiwan, ROC. 5. School of Public Health, National Defense Medical Center, Taipei, Taiwan, ROC. 7. Department of Pathology and Laboratory Medicine, Kaohsiung Veterans General Hospital, Kaohsiung, Taiwan, ROC. Glucocorticoid therapy, especially at higher doses, is associated with significant adverse side effects including osteoporosis. Leptin, secreted from adipose tissue, has diverse effects on bone tissue regulation. As glucocorticoids stimulate leptin synthesis and secretion directly in adipose tissue we hypothesised that dexamethasone (DEX) induced osteoporosis may, in part, be mediated by an osteoblast dependent leptin-leptin receptor pathway. Human bone cells expressed leptin and leptin receptors (Ob-Ra and Ob-Rb). DEX increased leptin, Ob-Ra and Ob-Rb expression in a dose-dependent manner while decreasing expression of osteocalcin. In the presence of leptin, Cbfa1 and osteonectin expression showed no significant change, whereas osteocalcin expression was decreased. Recombinant human quadruple antagonist leptin suppressed DEX-induced osteocalcin downregulation. The signaling pathway involved up-regulation of JAK2. In conclusion, upregulation of leptin and Ob-Rb in human bone cells by DEX is associated with down-regulation of osteocalcin expression. The down regulation of osteocalcin by DEX was partially through a leptin autocrine/paracrine loop. Adverse effects of DEX on the skeleton may be modified by targeting leptin signaling pathways. Glucocorticoids are important endocrine regulators of a wide range of cardiovascular, immunologic and metabolic functions postnatally and have multiple roles in development. Glucocorticoids bind to the cytoplasmic glucocorticoid receptor (GR) that dimerizes and translocates to the nucleus and binds to specific glucocorticoid response elements (GRE) . Synthetic glucocorticoids such as prednisone, prednisolone, methylprednisone acetate and dexamethasone are used widely for treatment of inflammatory diseases including asthma, inflammatory bowel disease, and rheumatoid arthritis . Treatment, especially at higher doses, is however associated with significant adverse side effects including osteoporosis [3, 4]. Glucocorticoid induced osteoporosis, in common with other forms of osteoporosis such as that resulting from gonadal insufficiency and high intake of alcohol, is characterized by loss of bone mass and deterioration of the microarchitectural bone structure leading to an increased susceptibility to fractures . Glucocorticoids have direct effects on osteoblast, osteocyte, and osteoclast function resulting in reduced bone remodeling and diminished repair of microdamage to bone. In addition to the direct effects on bone cells, glucocorticoids also have effects on the intestine, kidneys, gonads, and probably parathyroid glands, which may contribute to osteoporosis . Leptin secreted from white adipocytes is implicated in the regulation of food intake and energy expenditure in rodents and humans . It binds to the leptin receptor (Ob-R) which is expressed as several different isoforms . Leptins and leptin receptors have now been shown to be expressed in a number of organs and tissues in addition to adipose tissue [9, 10]. Leptins have diverse effects on bone tissue regulation with leptin receptor mutations . The predominant effect of leptins on bone metabolism appears to be through the hypothalamus by activation of the sympathetic nervous system . Nevertheless, evidence of a likely direct effect in bone appears likely as leptin induce bone growth and formation . As glucocorticoids stimulate leptin synthesis and secretion directly in adipose tissue [14, 15] we hypothesised that glucocorticoid induced osteoporosis may, in part, be mediated by an osteoblast dependent leptin-leptin receptor pathway. Dexamethasone (DEX) was purchased from Sigma-Aldrich Inc. (Steinheim, Germany). Recombinant human leptin/OB was purchased from R&D Systems Inc. (Minneapolis, MN, USA). The leptin antagonist, recombinant human leptin quadruple mutant (LQM), was obtained from RayBiotech, Inc. (Norcross, GA, USA). Bone samples were from surgical discard tissue obtained, with consent, at knee joint arthroplasty from Taiwanese patients with osteoarthritis (OA) (n = 12, mean age 69.5 years, range 58-83 years). All procedures were reviewed and approved by an institutional human research committee (TMU-JIRB No.201305003). Cortical and subchondral bone fragments were minced, incubated in antimicrobial solution for 4 h at room temperature, and washed with phosphate-buffered saline (PBS, pH 7.4) by vortex vigorously to remove fatty components. Bone fragments were maintained in modified McCoy's 5A medium (Gibco, Carlsbad, CA, USA) supplemented with 10% fetal bovine serum (FBS) (Gibco), 100 IU/mL penicillin (Gibco) and 100 μg/mL streptomycin (Gibco). Initial bone cultures were established in petri dishes (Orange Scientific, Braine-I'Alleud, Belgium) before passage into tissue culture flasks (Orange Scientific). Cell populations grown from these bone tissues demonstrated osteoblast-like characteristics with production of alkaline phosphatase. These cells showed no immunoreactivity with an anti-S100 antibody (DakoCytomation, Glostrup, Denmark) excluding growth of adipocytes (data not shown). Cells between passages 3 to 5 were used . HBCs were seeded at 1 × 105 cells/dish and grown as a monolayer for 5 days in 55 mm tissue culture Petri dishes. Cells were washed with sterile PBS twice, placed in serum-free media for 2 hrs, and then co-incubated with 0, 1, 10, and/or 100 nM of dexamethasone at 37°C for 24 hrs. Leptin (20 ng/mL) and the leptin antagonist LQM (500 ng/mL) were also used in the functional studies as stated in appropriate experiments. Controls were cultures in serum-free media incubated for the same time periods. Cells were cultured at a concentration of 1 × 105 as a monolayer for 5 days in 55 mm tissue culture Petri dishes. The cells were washed with 5 ml TBS and then fixed using 2 ml of a 1:1 methanol/acetone mixture per dish for 20 min at -20°C before further washing with PBS. The cells were then incubated sequentially with primary antibody overnight at 4oC. The antibodies used were polyclonal anti-leptin (1:10 dilution) (Upstate, Temecula, CA, USA) and monoclonal anti-Ob-R (1:100) (Santa Cruz Biotechnology, Inc., CA, USA) antibodies. Following washing in PBS cells were incubated for 2 h in darkness with goat-anti-rabbit or goat-anti-mouse IgG conjugated with fluorescein (1:50) (Jackson Immunoresearch Laboratories, Inc., PA, USA), washed again and mounted in buffered glycerin before viewing by fluorescence microscopy (Olympus). Negative controls without primary antibodies were performed for each test. Total RNA was isolated from cultures of HBC using easy-BLUETM Total RNA Extraction Kit (iNtRON Biotechnology, Gyeonggi-do, Korea). RT-PCR protocol has been described previously from our laboratory . Specific primers and amplifying conditions were shown in Table 1. All PCR products were size fractionated by 1.5% agarose gel electrophoresis, and DNA bands were visualized by staining the gel with 0.1 μg/ml ethidium bromide. Following stimulation, cells were immediately washed with sterile PBS and protein extracted using the CNMCS compartmental protein extraction kit according to the manufacturer's instructions (Biochain Institute, Inc., Hayward, CA, USA). In some experiments cells were lysed in situ with ice-cold lysis buffer containing 1% Igepal (Sigma), 100 μM Na3VO4, and protease inhibitor cocktail tablet (Roche Diagnostics, Mannheim, Germany) at 4°C for 15 min to obtain whole cell protein. Protein concentration was determined by the Lowry method. Equal amounts of protein (10 μg) were loaded onto 7.5% SDS-polyacrylamide gel and following electrophoresis were transferred to polyvinylidene fluoride (PVDF) membranes (Millipore Immobilon-P, Sigma). Membranes were blocked overnight at 4°C with 2% BSA in TBST (12.5 mM Tris/HCl, pH 7.6, 137 mM NaCl, 0.1% Tween 20). After washing with TBST, blots were incubated at 4°C with antibodies against Ob-R (B-3) (1:500 dilution), osteocalcin, JAK2 or phospho-JAK2 (1:1000) (Cell Signaling Technology, Inc., Danvers, MA, USA) diluted in TBST, washed again before incubation with HRP-labeled secondary antibody (1:1000) for 1 h at room temperature. Membranes were rewashed extensively and binding detected using the Enhanced Chemiluminescence Western blotting detection system, according to the manufacturer's instructions. Tubulin expression as loading control was assessed with the mouse monoclonal antibody Tubulin-alpha Ab-2 (1:10000) (NeoMarkers, Fremont, CA, USA). For measurement of leptin levels culture supernatants were collected and leptin concentrations were measured by ELISA (R&D) according to the manufacturer's instructions. Specific primers and amplification conditions. The db/db (B6.BKS(D)-Leprdb/J; deficient in leptin receptors) and wild-type (C57BL/6J) male mice at 7 months of age were used . Experiments were approved by the local Institutional Review Board (IACUC-15-102) and were performed in adherence to the National Institutes of Health Guidelines for the treatment of experimental animals. Fresh bone tissues from mice were collected for primary bone cell cultures which follow the previous HBC protocol. Osteocalcin gene expression levels in bone cells from the db/db and wild type mice (n=3 each) treated with either DEX or solvent for 24 h were determined by real-time PCR. Complementary DNA was produced from osteoblastic mRNA (5 μg) using the SuperScript II RNase H- Reverse Transcriptase kit (Invitrogene, Carlsbad, CA). Triplicates from each plate were used. The gene expression was analyzed by Applied Biosystems Step-One system. Primer sequences are as follows: m-osteocalcin, forward 5'-GACCTCACAGATGCCAAG-3' and reverse 5'-TCACAAGCAGGGTTAAGC-3'; m-GAPDH, forward 5'- TCACCACCATGGAGAAGGC-3' and reverse 5'- GCTAAGCAGTTGGTGGTGCA-3'. Bands were analyzed using gel documentation system (Bio-Profil, Bio-1D version 99, Viogene, USA). The values were expressed as ratio of the band intensity of the target gene to the internal control glyceraldehyde-3-phosphate dehydrogenase (GAPDH) gene or the target protein to the internal control tubulin. Variance and P values were analyzed by Alphaimager 1220 V5.5 (Alpha Innotech Corporation, San Leandro, CA, USA). A Student's t test was used for statistical comparison between groups. A P value of less than 0.05 was considered statistically significant. 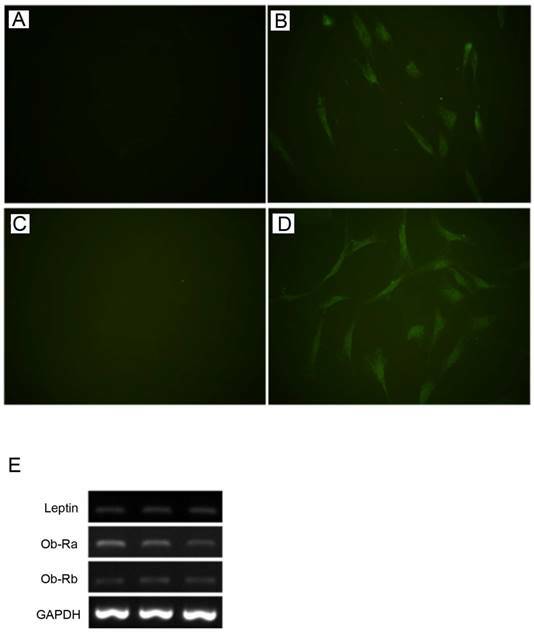 Leptin and Ob-R were shown to be expressed by HBC in monolayer culture at the protein and gene level by immunofluorescence and RT-PCR respectively (Fig. 1). RT-PCR demonstrated expression of both Ob-Rb (long) and Ob-Ra (short) forms of Ob-R.
To examine potential effects of leptin on bone homeostasis primary HBC cultures were incubated with leptin peptide and gene expression of Cbfa1 and bone matrix molecules assessed. Following incubation with 20 ng/ml leptin for 24 hours there was a significant decrease, approximately 25%, in osteocalcin gene expression by HBC (Fig. 2). There was no change in Cbfa1, osteonectin, collagen type I, and alkaline phosphatase gene expression under identical conditions. Expression of leptin and Ob-R in cultures of human bone cells. By immunofluorescence HBC showed expression of lepin (A, negative control; B, anti-leptin antibody) and Ob-R (C, negative control; D, anti-Ob-R antibody). (All figures, 400x). Expression of leptin, Ob-Ra (short form), and Ob-Rb (long form) demonstrated by RT-PCR in three representative samples of HBC derived from different patients (E). Effects of leptin on HBC gene expression of cbfa1, osteocalcin, osteonectin, collagen type I, and alkaline phosphatase. Incubation of HBC with leptin significantly decreased the osteocalcin expression (n=5, ***p=0.0003). There was no significant change in expression of the other molecules examined. All HBC cultures expressed alkaline phosphatase and its expression was not influenced by incubation with DEX under the experimental conditions (results not shown). There was a dose-dependent effect of DEX on leptin and Ob-R expression. As shown by semi-quantitative analysis leptin gene expression increased approximately 3.1-fold and 4.9-fold following treatment with 10 and 100 nM of DEX respectively (Fig. 3A). This was associated with increased levels of leptin in the culture media as measured by ELISA (Fig. 3B). Basal levels of leptin were 4.7 ± 2.0 pg/mL rising to 14.1 ± 7.9 pg/mL (3.2-fold increase) and 11.9 ± 3.8 pg/mL (2.7-fold) following treatment with 10 and 100 nM of DEX respectively. Ob-R gene expression increased approximately 1.8-fold and 2.2-fold following treatment with 10 and 100 nM of DEX respectively (Fig. 3C). Western blotting demonstrated a 3.3-fold and 5.4-fold increase in Ob-R protein expression by HBC following incubation with 10 and 100 nM DEX (Fig. 3D). As DEX increased leptin and Ob-R expression in bone cells we investigated whether the effects of DEX on HBC differentiation and regulation of bone matrix gene expression was through a leptin dependent mechanism. Collagen type I and alkaline phosphatase gene expression did not alter significantly following treatment with DEX over a concentration range of 1-100 nM (results not shown). There was minimal (9%) but statistically significant effect of DEX on expression of osteonectin gene expression at the highest concentration whilst Cbfa1 expression was increased by approximately 1.5-fold and 1.8-fold following treatment with 10 and 100 nM of DEX (results not shown). DEX had a dose dependent effect on osteocalcin gene expression with a significant decrease seen at both 10 and 100 nM (39% decrease) concentrations (Fig. 4A). The addition of leptin antagonist (A500, 500 ng/mL) blocked the inhibitory effects of DEX on osteocalcin gene expression (Fig. 4B). The osteocalcin protein expression by DEX showed a similar pattern to the gene expression (Fig. 4C). The effect of DEX in the osteocalcin gene expression of primary osteoblastic cells of wild-type and db/db mice was tested. Cells treated with 100 nM of DEX showed significant downregulation of osteocalcin in mice of wild type, but not in db/db mice (Fig. 5A). The post-receptor leptin signaling molecule to osteocalcin expression may be associated with the protein phosphorylation of JAK2 (Fig. 5B). Animal study in vitro. A. Inhibition of osteocalcin gene expression by DEX in primary osteoblastic cells of wild-type and db/db mice. Cells were treated with 100 nM of DEX for 24 h. Osteocalcin gene expression showed significant decrease in cells from wild-type mice, but not in db/db mice. B. In cells from wild-type mice, the post-receptor signalling molecule was associated with phophorylation of JAK2 in both DEX and leptin (Lep 20, leptin 20 ng/mL) treatment. 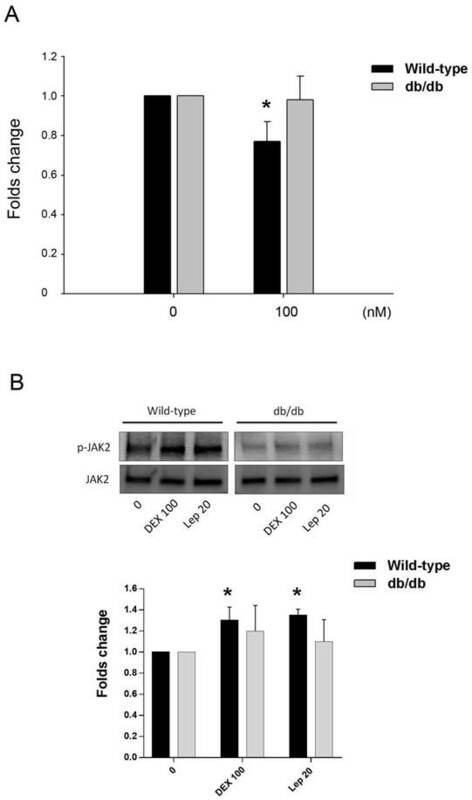 In cells from db/db mice, the tendency of JAK2 phosphorylation was not significant. The data expressed as mean ± SD. * denotes P < 0.05 as compared to control cultures without DEX treatment (n=3). In the current study we have shown that leptin and Ob-R are expressed by HBC in monolayer culture and leptin decreases osteocalcin gene expression in these cells. DEX increases leptin and Ob-R expression in HBC and effects of DEX on osteocalcin expression which is also confirmed by animal model, appear to be, at least in part, through a novel leptin dependant pathway. The leptin-leptin receptor pathway has been implicated in the control of a wide range of physiological processes including inflammation, angiogenesis, immune function, haematopoiesis, lipid metabolism, insulin action, and function of the reproductive system [19, 20]. In pathological settings the leptin-leptin receptor pathway may have roles in cancer cell proliferation, invasion and metastasis . Effects of leptin on bone are complicated with both central and peripheral effects. Genetically leptin-deficient mice, have a decreased trabecular volume in long bones, but an increased vertebral bone mass. Leptin replacement either centrally or peripherally corrects these abnormalities but doses of leptin required centrally are much lower than those needed peripherally indicating the existence of a pathway confined to the brain . Centrally, leptin acting through a central hypothalamic relay inhibits bone mass via the sympathetic nervous system . The leptin dependent regulation of bone mass occurs through via the β2-adrenergic receptor as β2-adrenergic receptor-null mice have a similar bone phenotype, without metabolic abnormalities. The sympathetic signaling directly affects osteoblasts which express β2-adrenergic receptors, controlling proliferation and differentiation through the regulation of AP-1 and genes involved in the molecular clock . 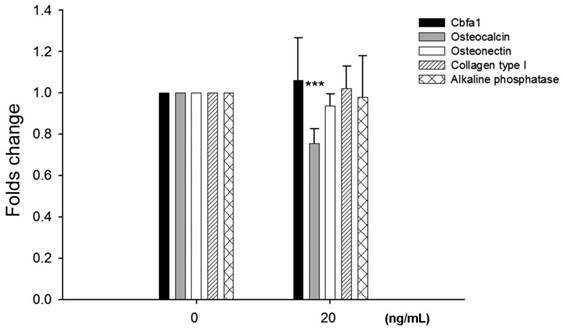 Sympathetic stimulation of osteoblasts increases expression of the receptor activator of nuclear factor B ligand (RANKL). The current study confirms reports of leptin and leptin receptor expression in human bone cells indicating roles for peripheral activity in regulation of bone turnover through paracrine and autocrine routes  and demonstrates that expression of osteocalcin by bone cells may be regulated by the leptin-leptin receptor pathway. In the present study, experiments were undertaken using bone cells derived from OA patients rather than normal adult bone and it is unclear whether the findings are unique to OA patients or are more widely applicable. Leptin levels are reported to be elevated in patients, particularly females, with knee OA [26, 27] and synovial fluid leptin concentrations are closely related to the radiographic severity of OA . Although it is accepted that OA is associated with a high bone mineral density (BMD) and that OA is generally inversely related to osteoporosis, the relationship between OA and osteoporosis remains controversial. Indeed, the relationship between OA and osteoporosis may differ by disease site, stage or pathogenetic basis [29, 30]. Furthermore, the pathogenesis of OA in non-obese patients is likely to be different to those of obese individuals where there is a significant contribution to the disease process through the action of pro-inflammatory adipokines such as leptin. Recently, the idea that obesity is protective against fracture is being increasingly questioned with the suggestion now that obesity is a risk factor for certain fractures . Previous studies have shown that treatment of rats with DEX results in decreased bone mineral density and mineralized matrix [32-35]. One of the mechanisms of DEX-induced bone loss is thought to be a direct effect on the osteoblast differentiation  via MAPK signalling although glucocorticoid-treated mice also demonstrate the change of apoptosis and autophagy in osteoblasts and osteocytes . DEX could downregulate the osteogenic markers including Runt-related transcription factor 2 (Runx2), alkaline phosphatase and osteocalcin . DEX induces histone deacetylase 6 (HDAC6) expression which binds to glucocorticoid receptor and may inhibit the expression of osteocalcin . However, the mechanism(s) by which DEX influences bone cell differentiation is not fully understood. Glucocorticoids, such as dexamethasone have a marked inhibitory effect on bone formation in vivo. In vitro studies on isolated osteoblasts show both catabolic and anabolic effects although the relevance of the latter is unclear. Pharmacological concentrations of glucocorticoids in vitro inhibit osteoblast proliferation and function whilst increasing osteoblast and osteocyte apoptosis. Similarly dexamethasone decreases proliferation of osteoclast precursors, reduces bone resorption and induces apoptosis in mature osteoclasts, with blunting of osteoclast activity and function having an additional indirect effect of further suppressing osteoblast function . In the present study DEX alters expression of osteoblast differentiation markers inducing a decrease in osteocalcin gene expression and upregulation of Cbfa1 at concentrations where increases in leptin and Ob-R expression are also seen. Blockade of the effects of DEX on osteocalcin expression by a leptin antagonist suggests that leptin signalling may contribute to the effects of DEX on bone cells. The post-receptor leptin signaling molecule to osteocalcin expression may be associated with the protein phosphorylation of JAK2 which is consistent with other investigations . Leptin has both anabolic and catabolic activity in bone. Leptin promotes bone differentiation in bone mesenchymal stem cells directly  whilst increasing RANKL expression by activating β-2 adrenergic receptors on osteoblasts through the sympathetic nervous system and increasing the activity of osteoclasts in bone resorption . There is increasing interest in the relationship between bone and energy metabolism with leptin and osteocalcin having key roles [43-45]. Whilst many of the potential interactions and effects are a result of endocrine signalling local mechanisms of regulation of osteocalcin and leptin levels in bone may have fine tuning effects. Production of leptin by cells of the osteoblast lineage and autocrine / paracrine activity are likely to play a significant role in both normal and pathological bone turnover including responses to mechanical loading [45,46]. Pharmacological regulation of leptin activity may provide an additional means by which primary or secondary abnormalities of bone turnover in a clinical setting can be positively influenced. This study was supported by grants from the National Science Council and Kaohsiung Veterans General Hospital, Taiwan (NSC97-2320-B-016-009-MY3, VGHKS104-100, and VGHKS105-126). We also thank Dr. Chian-Her Lee from Taipei Medical University Hospital for the assistance of sample collection.